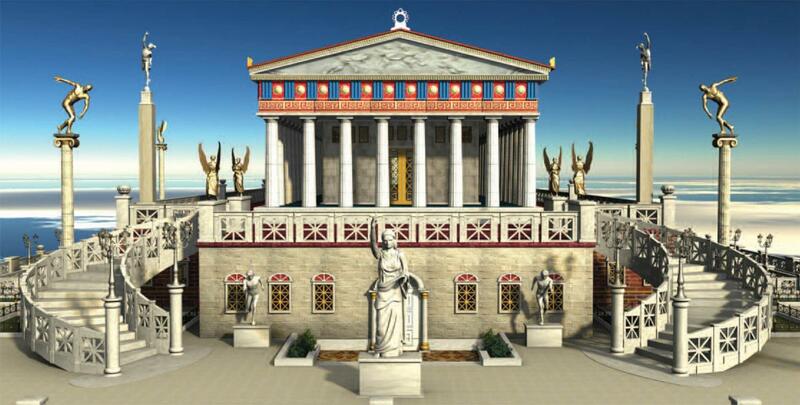 We decided to create the on-line "GREAT SCHOOLS OF ANCIENT GREECE". ... will enter HEPTAPOLIS, from the "Gate of Light", will choose from a special board the School that he wishes to visit, he will visit the School, and then he will choose from another board the Science that he wishes to complete his education with. Then he will choose either the course of a certain Sector of Science or some course from the Great Philosophy Schools in any combination he prefers and with a click on the Discipline or the School of his choice he will enter the respective field of AVATAR e-learning. In AVATAR e-learning he will watch "live" the Philosopher of his choice teach in a virtual environment, and at the same time he will have at his disposal the teaching module texts which correspond to the subject he has chosen. The contents of the teaching modules will be elaborating, with rich conceptual interpretations, so that the visitor can briefly, functionally and quickly absorb the meaning of the teaching of the philosopher on Man, Nature and the Universe. The evaluation and self-assessment questions will give him the chance to check himself the effectiveness of all the knowledge he gained from this unique educational process. "THE GREAT SCHOOLS OF ANCIENT GREECE"
In the easiest, cheapest and most noble way, students, in the classroom or in their home, through their telephone, or laptop, in winter and summer, in the mountains or on the beach, will learn in a pleasant way and will enjoy Socrates, Plato and Aristotle teach them the eternal Truths of Virtue, Happiness, the Soul, Afterlife, the Nature, the Earth, the Solar System, the Universe, God. The answers of the world's leading thinkers will contribute to the improvement of the body, the mind and the soul of the new generations so that in the near future world societies will have the privilege that their members have obtained, through their new studies, through AVATAR e-learning, the charisma of «Accomplished men». 1). At the entrance of 3D Heptapolis, the student-user pays 15 euros, gets the blue HEPTAPOLIS AVATAR e-Learning card and as a Member he enters through the Gate. 2). At the entrance of the Stoa, under the Library of Alexander the Great, there is the inscription: "WELCOME TO THE WORLD OF KNOWLEDGE" - THE GREAT SCHOOLS OF ANCIENT GREECE. 3). The user proceeds to the European Union Avenue. He passes the statue of Zeus-Taurus, with Europe on his back and the large fountains, he advances, he arrives at the entrance of the underground Stoa of the building of Europe, which has the inscription: LEARN TO THINK. The user will be able to “click” on each subject and study the Philosophical analysis of the subject (Philosophical Coaching, Philosophical Consulting, Decision Maker, Leadership and Opinion Maker). What is the State? What is Logic? On entering each "Melathron" the visitor is informed with very high level explanations, what the Ancient Greek Philosophers’, but also some modern thinkers’ answer is to each separate question. In each School, the Teacher is the wise man himself. As the student enters the School, he finds himself in front of the area where the wise man used to teach. For example, Plato taught in the Academy, Aristotle in the Peripatos, Socrates in his prison, etc. With a “click” the visitor enters Plato’s Academy which looks exactly like it was around the 4th century BC. The student-user, in his chosen order, follows Plato’s program separately, at the level of teaching, from Plato's and his student's mouth, and according to the bibliography scientific data. This is the main body of the Education that the user-student chose in order to obtain his Diploma at the end of his Education. In the next stage of his Classical Education the user-trainee visits Tholos. On the menumental entrance there is the inscription: WHAT IS THE BEING? Entering Tholos area, the user finds himself in front of the Panorama of Microsmos and the Megacosmos. Microcosmos, in the lower half of Tholos, describes with texts, 3D images and videos the amazing achievements of Quantum Science, the penetration of Knowledge within Matter, the living nano-organisms that make up the material things of nature and the world, their sequence, their interdependence and their relation with the Supreme Force, which regulates their existence and their harmony. In Megacosmos are described the miracles of Heavenly Mechanics, which obeys the laws of gravitational pull and interaction, both of which together constitute harmony. The trainee is led to the central point of the Cosmic Sphere and is informed of his role as an individual, as a human being and as part of the Universal Machine, as well as of the role he is required to play in the course of his life towards his fellowman, nature and the Being, God. The main purpose of the teaching within Tholos, is the person's awareness of his relation with the Being. A basic provision of AVATAR-e-Learning as an Educational Mechanism is the "Use of Knowledge", which the trainee can accomplish through Classical Education in order to use it in his chosen profession in the future and become a useful, efficient, knowledgeable and above all moral citizen in society. Conclusion: The Classic Education the user/student acquired through AVATAR-e-Learning has become a "lever of function" for his chosen profession. In short, his professional qualification will undergo all the influences of Classical Education so that the trainee becomes a "useful practitioner". In the last stage of Education, which takes place in the Circular Stoas of KYTTARON, the user-trainee enters the School with the sign at its entrance: "CLASSICAL EDUCATION AND CONTEMPORARY ORIENTATION" to watch in 2D and video the relation of the Classical Teachings with the modern behavior of the citizen, so that he becomes a "useful person", a good professional. The course is a model for any career-orientated science chosen by the learner to attract the interest, after he has obtained his Diploma at the end of the course with HEPTAPOLIS AVATAR-e-Learning, of any entrepreneur who he will come in contact with through the HEPTAPOLIS website. The building of the Academy of the Nations - On the lower level, the terrace. Automatically, with a "click" the Diploma appears on the computer of the rewarded user, and his name is included in the list of the new AVATAR e-learning professionals while his CV will appear with a "click" on every interested entrepreneur’s computer. Within the next twenty days, the Diploma – Golden Wreath, signed by the Scientific Committee, will be sent to the address of its holder.